If you like your art truly abstract, you should love the latest three-person show at the Visitor Center of Thompson Park in Lincroft. Few of the works ever come close to images of reality, the nearest being when the paintings by Bascha Mon suggest interiors. The average viewer might argue that, for such a large exhibit, this borders on too much abstraction, with nothing to balance the effect. The media and styles do vary, however, and pleasantly. laged,” using a prominent strip of gauze to create a sweeping movement. “Hearts and Flowers” provides the symbolic reference points of a row of yellow hearts, an abstract garden and the faint outline of an iron gate; “Home at Last” suggests the frames of doors or windows. But in general the viewer will be content to absorb the sunny, upbeat feeling the works create without making literal translations. Most of the mixed-media pieces by Natalie Craig of Long Branch are included in her “One to One: A Suite of Formalities.” Using pastel, pencil, thread and vellum, she takes advantage of the natural irregularities of the materials and their interaction. Craig colors the background material, sometimes a sheet of newspaper, with pastel of charcoal, then places vellum over it for a distant, blurred effect. Sometimes the vellum is attached with glue, at other times it is sewn on. A “foreground” is created when the artist draws or paints sharper and more brightly colored lines on top of the vellum. Sometimes these lines are short and straight and can scarcely be distinguished from the stitching. When you are in the mood for a total excursion into abstract, drop down to Thompson Park, on Newman Springs Road in Lincroft. The three-artist show remains on view through May 28.
evoked by her groupings of hard-edged bands that contain dense black-and-white or brown-and-white textury patterns. “Eight on the Richter Scale” involves seven of these bands, or narrow rectangles, standing vertically, while a red line runs down and through them like a rupture. Several works in a series called “Temporal Steps” portray either vertical or horizontal groupings of these forms with one band slightly out of kilter, and contrasting in color, either solid black or patterned brown. As a change from this crisp technique, painter Bascha Mon of Long Valley uses soft tones and misty outlines. Her canvases and mixed-media works have a general resemblance to rooms and occasionally exteriors of buildings, distorted as in a memory. Her large oils such as “Sissy, Cabbages and Friendship,” “Cross-References” and “Ritual” use loosely geometric areas, chiefly quadrangles with slanting vertical borders. The colors are all soft and similar in value; various depths and textures are indicated by stripes, curlicues and speckles, as well as by painting one tone over another. As an artist, Bascha Mon ‘s approach to her work is both additive in process and intuitive in nature. Paintings, monotypes and sculptural installations evolve from the interaction of media and narrative, sometimes subtly, sometimes explicitly. Recent works in encaustic relate both to the layering of brush strokes of color in her early paintings as well as to the use of robust colors which developed in the later series of plaster heads. While one series of installations reflects a trip to Japan and the impact of its visual traditions upon her, another combines sculptural heads with a collection of small painted chairs, tapping into our experiences of the world as children. As her work continues to evolve, it references both painterly and sculptural concerns and, as always, the world which she inhabits. Having come to teaching later in life, Bascha Mon has brought a wealth of information to her students along with a love of all things visual, so evident in her own work. Her receptivity to other cultures, the performing arts, and nature, along with her own personal background, have been combined with the need to creatively express these experiences .Most significantly, she has been able to pass this enthusiasm along to her students, often using experimental approaches to develop their innate talent and to stimulate their own explorations. By presenting the unexpected, the ordinary is re-evaluated and becomes something other than what it was.This can take the form of using touch, smell, sound and taste to stimulate creativity, or collaborative efforts which enable students to interact and enlarge their individual experiences in the creation of a new image. Students are also constantly exposed to other artists whose works seem pertinent to their own explorations of form, color or ways of looking at the world. Bascha Mon has encouraged her students, not only to look and see, but to develop and accept their own creative voices. Several plaster heads, many with antennae and painted with metallic pigments. They result from Ms. Mon’s recent foray into making more conventional sculpture. They have a goofy presence, like space aliens, and certainly jar the contemplative aspect of the rest of the piece. THE sculptures of Bascha Mon are energized by opposition. Ms. Mon puts disparate objects together in ways that are at once audacious and subtle, sophisticated and ingenuous, compulsive and calculated. Made of both found and created objects, they are repositories of memories: Ms. Mon’s personal fixed memories, often potently intersecting with the collective memory. 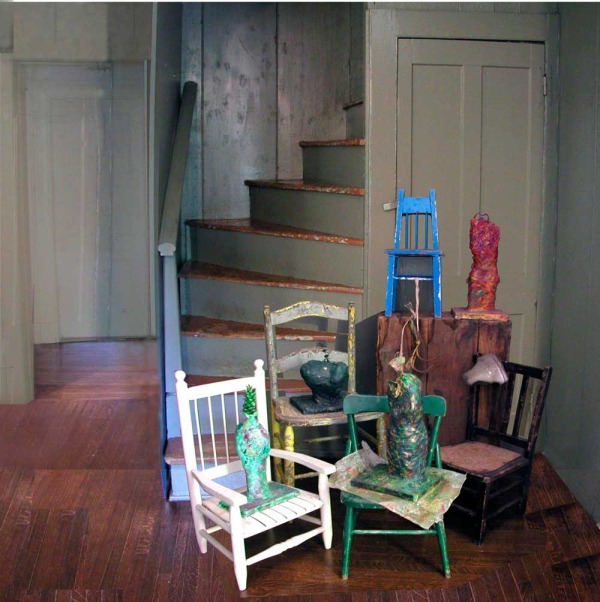 Eleven of her sculptures are currently at Tomasulo Gallery at Union County College here, where they ramble over a gray carpet, lean against the wall or just perch on pedestals. Each work is a fresh challenge, but viewers are also reassured by the presence of several constants. Chief among, them are rocks, which have weight and solidity, and mirrors, which convey ephemerality and illusion, and the artist uses this contrast to perpetuate illusion. In the exhibition, real rocks are mixed in with artificial ones, while mirrors are employed to extend a work, make it seem larger than it is or reveal another side of a component part. Ms. Mon was born and reared in Newark, where her parents ran a store that sold notions, lace and other decorative trimmings, which may play a part in her readiness to embellish everyday objects. The first work a viewer might encounter, and an especially inviting one, is “Cow Redux,” a stacking of objects culminating in a charcoal drawing of a cow’s head that Ms. Mon made 27 years ago. (Ms. Mon has been a painter most of her career, and recycled two-dimensional work frequently appears in the exhibition.) The drawing is accompanied by a watering can that was her father’s, a manure spreader, a scrap of burlap she found near a cemetery, a metal box in which milk bottles were kept, and a wooden crate holding a shard of red glass from a taillight, a souvenir of a car accident, along with a small smooth wooden dowel that is there ‘just for esthetic reasons, to balance the broken glass,” Ms. Mon remarked in a conversation at the gallery. The transforming event of her life and career, she says, was three weeks spent in Osaka, Japan, in 1991, a result of winning a prize in the Osaka Triennial. She seems to have quickly soaked up Japanese culture and esthetics, an orientation that, she says, is responsible for the contemplative nature of much of her work. The’two most extensive works in the show have strong Japanese motifs. “Visitors to the Illusory Garden” mimics a rock garden, but the tall, craggy forms and the smooth slabs evoking steppingstones are painted plastic foam. On the slabs are fixed amazingly sharp pictures of manhole covers, the design of which is evidently a high art in Japan Ms. Mon savors the coexistence of a garden and a sewer, and to complicate the mix further there are several convincing trompe 1’oeil arrangements of commonplace but often unrelated objects. The nearly closed umbrella is posed against a roof taken from a Japanese doll house. These, along with a sheaf of bamboo, a bamboo stool hung upside down from a rope, and the 1950’s-style shade from a floor lamp that Ms. Mon had in college, turned upside down to become a bowl, are other things to ponder in the crowded work. A picture frame holds a Japanese newspaper, along with recycled drawings, and a clear plastic bag of dead leaves hangs from the frame. One rather grubby plaster head is on the scene as an observer. (ANOTHER entry from “A Collagist’s Diary” is an open suitcase, also an artifact from Ms. Mon’s college days, with a round mirror inside the lid. It is filled with a nest of brightly, even garishly colored neckties, along with the tattered remnant of an American flag found near a cemetery. The coiled neckwear is weighed down by a real rock, seemingly to prevent it from slithering away. Ms. Mon uses such an arrangement of ties as a still-life subject in painting classes she teaches at the Hunterdon Museum of Art in Clinton and the New Jersey Center for Visual Arts in Summit. The smaller works, too, reflect the events, large and small, of Ms. Mon’s life. A viewer senses that Ms. Mon has embarked on a continuing project that can never end. Nor can it be neatened up and fitted into a tight category of art. Many artists enshrine objects from their past, but Bascha Mon’s knack for poetry, and her sense of abandon, set her apart. Through June 18. Hours: Mondays and Saturdays, 1 to4 P.M.; Tuesdays through Thursdays, 1 to 4 P.M. and 6 to 9P.M. For quite some time critics said that nothing “new” could be created in the world of art. All the isms had been done – we were left to repeat the past in the age of pluralism. It is now clear, however, that important artists always have something new to contribute. Like a fingerprint we all have something no one else has. Bascha Mon has achieved this singularity in her work and she has inspired it in her students. The human head is a subject that goes back to the very beginnings of what we know about our visual history. Humans have portrayed the head in an endless variety of ways. Today, technology being what it is, we can draw from almost every culture and time period ranging from prehistoric cave paintings, the ancient Greeks, Romans, Egyptians and Asians to the tribal arts of the Americas, Africa and Oceania. Nearly all these sources seem combined, recombined, reduced and worked into a pure essence of the human head in Bascha Mon’s sculpture and paintings. With pigments that seem drawn from the earth and rough-hewn surfaces that feel worn to a shadow of a former complexity, Mon’s heads look as if they have been dug up from an ancient past. The simple geometry of prehistoric Cycladic heads are buried in her surfaces as are the classical Greek busts, Asian warriors, the heavily worked, elongated heads of Giacometti, the dark and rueful heads of Roualt, and the simple planes of Modigliani’s women. This syntheses makes the viewer linger over a sense of recollection that is both subconscious and deeply personal. Ms. Mon’s examination of the human head is deeply compelling for the same reasons she is a successful teacher. She is able to guide her students away from preconceived notions about art into a willingness to tap into and trust their less conscious and unique gifts. Ms. Mon was born and reared in Newark, where her parents ran a store that sold notions, lace and other decorative trimmings, which may play a part in her readiness to embellish everyday objects. The first work a viewer might encounter, and an especially inviting one, is ”Cow Redux,” a stacking of objects culminating in a charcoal drawing of a cow’s head that Ms. Mon made 27 years ago. (Ms. Mon has been a painter most of her career, and recycled two-dimensional work frequently appears in the exhibition.) The drawing is accompanied by a watering can that was her father’s, a manure spreader, a scrap of burlap she found near a cemetery, a metal box in which milk bottles were kept, and a wooden crate holding a shard of red glass from a taillight, a souvenir of a car accident, along with a small smooth wooden dowel that is there ”just for esthetic reasons, to balance the broken glass,” Ms. Mon remarked in a conversation at the gallery. ”Visitors to the Illusory Garden” mimics a rock garden, but the tall, craggy forms and the smooth slabs evoking steppingstones are painted plastic foam. On the slabs are fixed amazingly sharp pictures of manhole covers, the design of which is evidently a high art in Japan. Ms. Mon savors the coexistence of a garden and a sewer, and to complicate the mix further there are several plaster heads, many with antennae and painted with metallic pigments. They result from Ms. Mon’s recent foray into making more conventional sculpture. They have a goofy presence, like space aliens, and certainly jar the contemplative aspect of the rest of the piece. This garden was to be used last year as the set for a performance piece at Aljira: A Center for Contemporary Art in Newark. The performance never took place, but an antique Japanese umbrella that would have been part of it turns up in ”A Collagist’s Diary: Wandering and Wondering,” an amalgam of objects compactly arranged to resemble a large painting. Indeed, it recalls the work of the 19th-century American painters William Harnett and John Peto, who made convincing trompe l’oeil arrangements of commonplace but often unrelated objects. The nearly closed umbrella is posed against a roof taken from a Japanese doll house. These, along with a sheaf of bamboo, a bamboo stool hung upside down from a rope, and the 1950’s-style shade from a floor lamp that Ms. Mon had in college, turned upside down to become a bowl, are other things to ponder in the crowded work. A picture frame holds a Japanese newspaper, along with recycled drawings, and a clear plastic bag of dead leaves hangs from the frame. One rather grubby plaster head is on the scene as an observer. A NOTHER entry from ”A Collagist’s Diary” is an open suitcase, also an artifact from Ms. Mon’s college days, with a round mirror inside the lid. It is filled with a nest of brightly, even garishly colored neckties, along with the tattered remnant of an American flag found near a cemetery. The coiled neckwear is weighed down by a real rock, seemingly to prevent it from slithering away. Ms. Mon uses such an arrangement of ties as a still-life subject in painting classes she teaches at the Hunterdon Museum of Art in Clinton and the New Jersey Center for Visual Arts in Summit.